What’s New? Community Yoga, Spanish TV Interview and Book Festival…Oh My! My first graders and I have finally found a nice and fun paced rhythm in the class. Outside of the classroom I’ve also been quite busy, stressed out, but mostly excited for how things are unfolding. In the beginning of the year I wrote how I was in a yoga teacher training program because my hope was to offer an affordable yoga class to my community that doesn’t have a yoga studio in the neighborhood. For the last few weeks the owner of Mary’s Dance Fitness, let me have her zumba time slot to see if people would come to a community yoga class. Thankfully, people have ventured out to try a yoga class, in most cases their first. Since enough people have showed up, I now have my very own yoga class. It doesn’t possess the sleek and polished swagger of a high end yoga studio, but it’s a great place to start. The owner is a dynamic lady from México who has a zest for life and it is so apparent when she teaches zumba. I’m really grateful that she is taking a chance on my vision and I very much hope it’s a success. I’m really enjoying teaching yoga and learning a lot as I plan for the classes. If you are in the South Bay area in Los Angeles – stop by and bring a friend. I’m also calling it #comadreyoga since the classes end up being taught in Spanglish with Spanish songs and grooves. 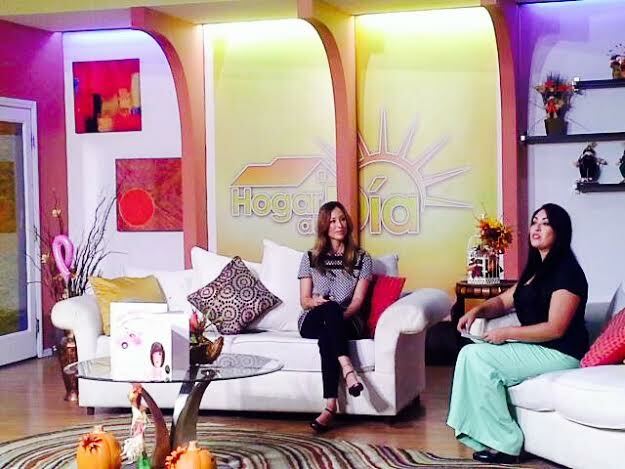 I was also interviewed last Friday on a Spanish morning show, Hogar al Día. I can’t believe I agreed knowing that my español is nothing less than rusty and inept to say the least. My dad told me after the fact, “Don’t worry sweetheart, they’ll edit it.” I had to remind him it was a live taping. But, I went on like a trooper and actually enjoyed the energy behind the show. The host, Carmen Aguilera was so patient with me as I stammered to get the words out- God Bless Her! It’s one thing talking to your Abuelita in Spanish, live TV is another thing. On the morning show I got to talk about my picture books and an upcoming event that I look forward to attending, The Los Angeles Latino Book & Family Festival. This free cultural and family event will take place on Saturday, November 1st, 2014 at East LA College from 11-5 PM. I will be on a panel at 11-12 AM and signing later in the afternoon. 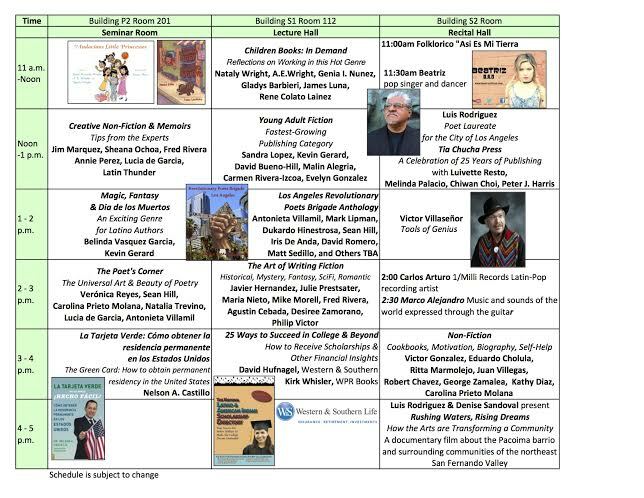 But what I’m ecstatic about is getting to meet Victor Villaseñor, author of Rain of Gold and Luis J. Rodriguez, the official Poet Laureate of Los Angeles. I read their books in college- so amazing! There is a great deal going on. I need an extra two days in the week to catch up on sleep – but this journey is well worth it. I hope to see you at the Los Angeles Book & Family Festival or maybe even at a #comadreyoga class. In the meanwhile, I’ll be brushing up on my Spanish skills. 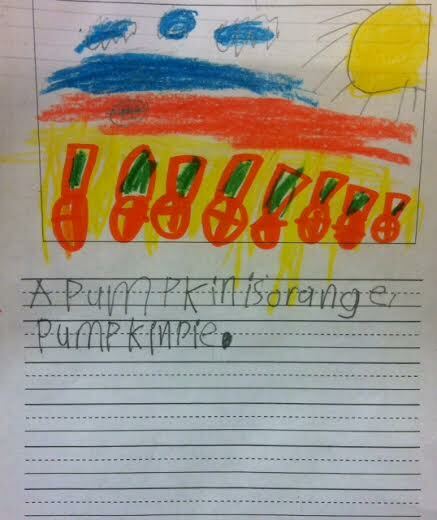 Pumpkin Pumpkin by Jeanne Titherington. So cute to hear my little first graders sing their hearts out. 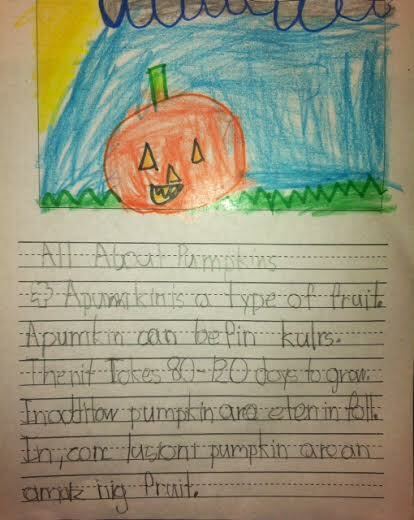 We also read informational books and found kid friendly websites to research pumpkin facts. 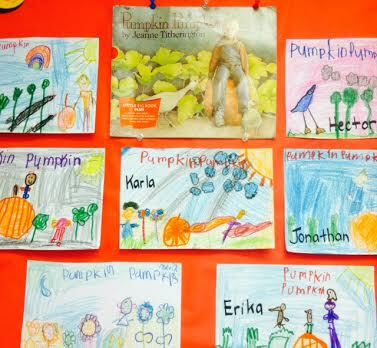 Our amazing school librarian, Mrs. Fernandez helped me find this informational text, The Pumpkin Book by Gail Gibbons. 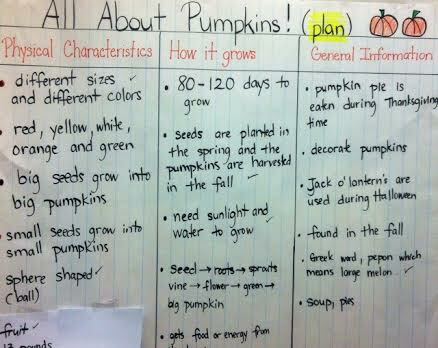 I explained to the students that we were researching and gathering information to help us write informative paragraphs on pumpkins. 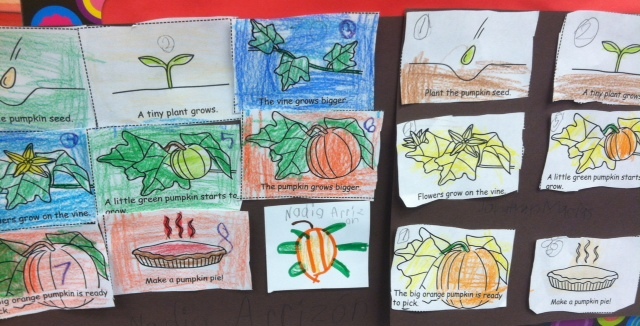 We also did a quick activity on the life cycle of the pumpkin. In the coming days we will use the sequencing cards to write about it. Incidentally, our school has a solid writing program in place, Get Ahead Writing, that is implemented by all teachers throughout the grade levels. So when I told the students we were going to create a shared plan, many of them were familiar with this important step. (Big shout out to the K team!) The students then devised their own plans to write informational pieces. This was also the first time my first graders went through the entire writing process (plan/brainstorm, write, edit, revise & publish). Let me be honest, it was not an easy feat. However, I know from previous experience that as their reading and writing skills develop, the easier and smoother the writing process will be. Here are some of the “published” writing pieces. A pumpkin is a type of fruit. 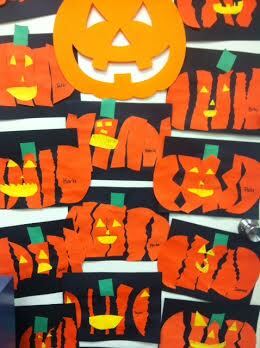 A pumpkin can be different colors. Then it takes 80-120 days to grow. In addition, pumpkins are eaten in the fall. In conclusion, pumpkins are an amazing fruit. I will be bringing real pumpkins to the class so those who are not familiar with them have the opportunity to touch, feel and investigate this amazing fruit. And for those of you who think pumpkins are a vegetable – it’s a fruit!